Robert Macaire is a villainous character adopted by Daumier from a melodrama that was popular at the time. 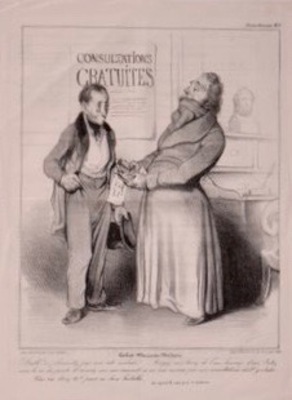 Daumier recreates him as a charlatan involved in numerous professions, among them the doctor and pharmacist. Here Macaire swindles a patient while offering supposedly “free” consultations. Included in Honoré Daumier III: Law, Medicine, and Social Satire exhibition, 2018.